Okay..it can snow now. Well..maybe wait for a few days yet. Sunday September 25th was the last day of summer operation for Kicking Horse and also for Vagabond Lodge. We always finish off the season with lunch at the Eagle's Eye Restaurant at the top of the mountain. Then Patrick from Selkirk Sports joined me for my final ridge hike for the summer. It was a little cool but great hiking weather. The hike took us about 3 hours return. We have a 10% Early Bird Discount we are offering until October 1. Reservations need to be made direct with us to receive this savings. Short video is of our last hike. It's a tradition I hope continues for a long time. Today was our second annual "top of the mountain picnic to end another summer." A group of friends from both Kicking Horse and Golden and area treked up to the top of T2 about 11.30 or so. We had a miserable day yesterday and even this morning it didn't look too promising but it ended up to be just a fabulous day. There was a little snow on the ground at the top and the mountains in every direction had a good dump overnight and yesterday. We had over 20 people who joined us and we even had a barbecue. It doesn't get much better. Now we can officially put the summer to rest and look ahead to the upcoming winter. 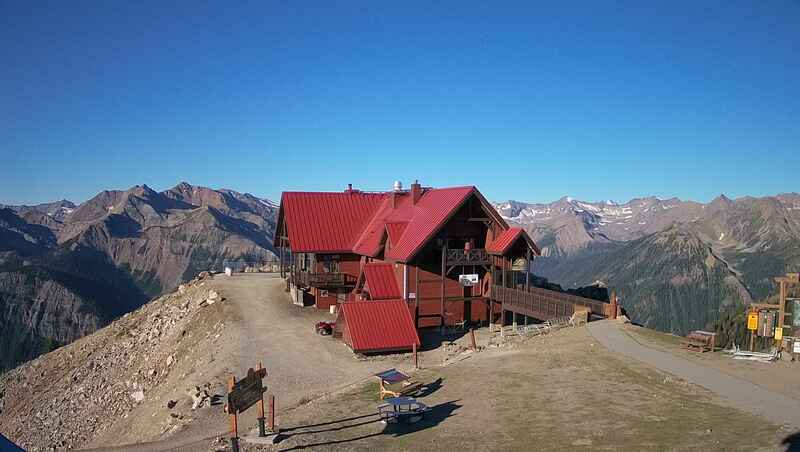 Vagabond Lodge will close starting September 28th until ski season which is usually the first weekend of December. I will keep you posted. It has been an awesome summer and very busy for us. Here is a short video of our barbecue. Enjoy. Things here at Vagabond Lodge are winding down for the summer season and we will be closing on September 25th until ski season. And from the looks of things ski season isn't far away. We have had cool wet weather for the past week or so and this morning some nice snow covering the mountains around us. I have been discovering more great mountain biking in our area. I have got hooked on an "Ebike" which we bought last year. It basically looks like any other mountain bike but has a battery and a motor that helps you peddle if you want. And it can take you to spots you normally would not go or if you did..it would be a major grunt. You still have to peddle but it just makes it easier if you want. Along with friend Patrick from Selkirk Sports we did an awesome ride a few days ago that involved some of the cross country ski trails near Vagabond Lodge and then hooked on to an old rail bed(1920's) that took us on a 30 km return trip just below Vagabond Lodge to the North. There are a few log bridges to cross(don't ride). It is a 2% grade which means not a lot of uphill or downhill and except for some deadfall over the trail, it was an easy and pleasant ride. Next time we are going to continue for about another hour(we think) and will hook on to the Trans Canada Highway(#1). Maps show the road we were on connects. Overall it took us about 3 hours with a number of stops.